"What Possessed Them To Make Such a Terrible Abhorrent Movie?" THE POSSESSION OF HANNAH GRACE is a “B” horror movie about a recovering addict and former police officer who finds herself in a demonic situation after starting a new job working in a morgue. 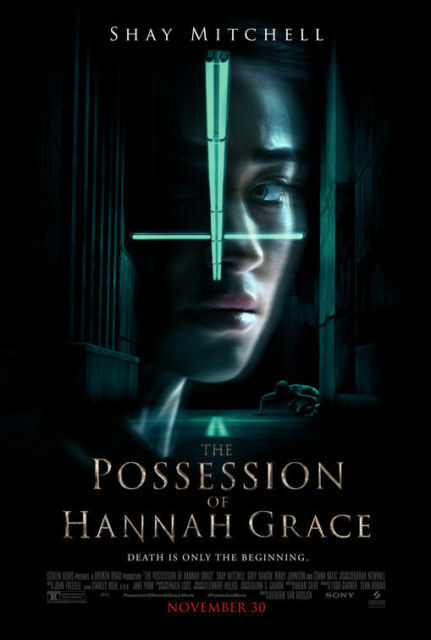 THE POSSESSION OF HANNAH GRAE is a poorly directed and written horror movie, where the name of Jesus doesn’t have the power to defeat supernatural evil, but human willpower and effort do. THE POSSESSION OF HANNAH GRACE is a “B” horror movie about a recovering addict and former police officer who finds herself in a bad supernatural situation after starting a new job working in a morgue. Megan was a rookie cop in Boston who accidentally let her partner get shot and killed. The guilt for not stepping up and acting in the situation drove her to alcohol and prescription drugs and destroyed her relationship with her boyfriend Andrew, who’s also an officer. Megan’s AA sponsor, Lisa, helps Megan get a job at the Boston hospital intaking dead bodies from ambulances during the graveyard shift. Located at the bottom of the hospital, the graveyard shift leaves Megan all alone throughout the night to process dead bodies as they enter the morgue. For someone who’s already struggling with PTSD and guilt, it’s clear to the audience this is a bad idea. Eventually, the body of a brutally murdered young girl comes in to be processed. As soon as the body arrives, weird things begin to happen around Megan’s workspace, such as all her electronic gear malfunctioning. Also, a man sneaks in and tries to steal the body and throw it into the incinerator. Megan stops him and calls Security. The man reveals himself to be the girl’s father and says her body was possessed by a demon that priests were unable to cast out from his daughter. Every time the demon kills someone, the body of the girl heals. The only way to destroy the demonic curse is in the fire. Of course the man is crazy, or so Megan thinks. As soon as the man’s arrested, the demon starts a killing spree around the hospital. Will Megan be able to stop the demon? THE POSSESSION OF HANNAH GRACE has a few creative visual tropes, and the acting from Shay Mitchell (PRETTY LITTLE LIARS) is better than most horror movies. What keeps the movie from being truly scary is that it makes the common mistake of showing way too much. The suspense that the first half of the movie builds is undercut in the second half when viewers frequently see the demon creature stalking its prey in the body of the young girl. It’s quite disturbing and grotesque to watch, but not really frightening. Sadly, the worldview of THE POSSESSION OF HANNAH GRACE is very unbiblical. For example, the beginning has a scene where which priests attempt an exorcism over the little girl, but their attempt proves unsuccessful. One priest is even killed by the demon-possessed girl. Ultimately, it takes an act of bravery from Megan at the end with a gun to shoot the girl and throw her into the fire. Thus, supernatural evil is beaten by human willpower and effort, and not by Jesus, faith, prayer, or fasting. Also, the little girl is never saved, which is depressing and annoying. Add to all this the fact that the violence is grotesque, and THE POSSESSION OF HANNAH GRACE is an abhorrent, unacceptable occult horror movie with an Anti-Christian, godless, humanist spin to it. THE POSSESSION OF HANNAH GRACE is a “B” horror movie about a recovering addict and former police officer in a bad supernatural situation after starting a new job working in a morgue. Megan works by herself underneath the hospital of Boston Metro. When the body of a young girl arrives, it turns out she’s possessed by a demon. The demon begins to wreak havoc, and Megan must stop it. THE POSSESSION OF HANNAH GRACE has several creative visual tropes, and the acting from Shay Mitchell is better than most horror movies. What keeps the movie from being truly scary is it makes the common mistake of showing way too much. Sadly, the worldview of THE POSSESSION OF HANNAH GRACE is strongly unbiblical. For example, the beginning has a scene where priests try an exorcism over the little girl that proves unsuccessful. One priest is even killed by the demon-possessed girl. Eventually, supernatural evil is beaten by willpower, not by Jesus or Christian faith. Also, the movie’s violence is often grotesque. THE POSSESSION OF HANNAH GRACE is an abhorrent occult horror movie. Starring: Shay Mitchell, Grey Damon, Kirby Johnson, Nick Thune, Louis Herthum, Stana Katic, James A. Watson Jr.